Any normal gambling offer is tilted in favor of the house. Gambling commissions publish on their website the “return rate” of all their products. A typical lottery will return about 45% in prize. 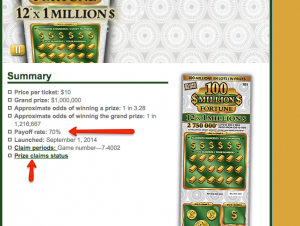 A typical scratch ticket lotto returns 60% to 70%. How do we get to above 100% from those normal money-losing odds? The thing with scratch tickets is that it’s an ongoing process. First they print a large amount of tickets with these defined odds and return rate. Then they get sold slowly over several months. The wildcard that changes everything is the fact that these gambling commissions have to disclose the number of grand prize claimed on their website. A scratch lotto is pointless If all the grand prizes are won. Inversely if half the tickets are sold but none of the grand prizes are won the odds have completely changed. You can gauge the sales by checking the number of smaller prize claimed. These smaller prize are usually numerous and dispersed evenly. If most the small prize are won, but none of the big prize are, you got a hot ticket. Joan Ginther had a lot of cash. She just bought an enormous amounts of tickets everytime she felt the odds were in her favor. She seemed to do pretty well. I don’t have a few hundred thousands dollars to gamble on scratch lotto. However I think there is still some cash to be made here. There are millions of gamblers in America. They would probably like to be alerted whenever a scratch lotto becomes “hot” in their state. To monetize this factoid I’d build a website displaying the best scratch lotto by state. (This already exist). However the focus of the website would be to convert visitor into subscribers to a mailing list alerting them of hot tickets. If this list can grow it would very valuable. It would be a list of active gambler sorted by state. Perfect for pushing gambling related offers! Casinos spend a large amount of money to bring visitors in. They’d love this list. Check out this list of CPA offers. Over $200 per customer you bring! Since the value of these hot ticket alerts is both unusual and interesting it is has some viral potential. Picture this: Texas Mom wins millions FOUR times using this simple trick! This kind of stupid headline exist because it works. Will I do this project? I’m not sure yet. You can steal the idea!